Sarah Ellen, a daughter of Minerva Parks and John Barclay, became an heir of uncle Alexander Barclay after the affidavits about the status of her father, John Barclay, were submitted to the Probate Court of Dakota County. Again the following is a mix of my research and my cousin’s. Sarah Ellen Barclay was born the 29 March, 1869 in Sibley Co., Minnesota. She died on 16 August 1957 in Seattle, King Co., Washington as Helen Westerholme. She started using the name “Helen” by 1910. At the time of Alexander Barclay’s probate process in 1906, she was known as Sarah Ellen Sears. We find Helen Sears with Lewis Sears in the 1910 Census. Sears, Helen, wife, F, W, 40, M2, 5, 1 Child born, 1 living, born Minnesota, Father born Minnesota, mother born Minnesota, English, none, yes, yes. Source: Sears, Lewis Family, 1910 U.S. Federal Census, Seattle, King Co., Washington, SD#1, ED#216, Sheet # 7, Ward of city #14, enumerated 19 April, 1910, by Alonzo Wardell. Unfortunately, tragedy struck and Lewis died 2 July 1913 in Seattle and is buried in the Mt. Pleasant Cemetery on Queen Anne Hill next to her brother John A. Barclay’s grave. I have not found an obituary notice at this time for Lewis Sears but I did find a picture of a man who could be him but I cannot post here so below is the location of the article. Source: Newspapers.com, The Seattle Republican, Seattle, WA, Friday December 25, 1903 First Edition. He was very handsome. What follows is the caption under the picture. Years pasted and Helen, as she was calling herself now, remarried to Alex W. Westerholm on the 13th day of February, 1918, in Seattle, King Co., Washington. He may have been Axel rather than Alex. Source: #57932/62544, State of Washington, County of King, John B. Wright by authority of license bearing the 13th of February, 1918, Lawful Wedlock Alex. W. Westerholm and Helen Sears witnesses were S.W. Biggs and a Leola May Blinn. They are together in the 1920 U.S. Census. Line 82, Arrowsmith Ave., 9767, 175, 189, Westerholm, Axel W. Head, O, M, M, W, 42, M, 1899, Na, yes, yes, born Sweden, Swedish, parents Swedish, yes, Sea Captain, Alaska Steamship Co. W.
Source: A. Westerholm Family, 1920 U.S. Federal Census, Seattle, King Co., Washington, SD#1, ED#317, Sht. 7, enumerated 13 January 1920, by Martha F. Steele. An interesting development, John Barclay is living with his sister in Seattle in 1930. Barclay, J.V., brother-in-law, M,W, 52, S, no, yes, born Minnesota, father born Scotland, mother born Illinois, yes, laborer, Lumber Mill. Source: Capt. Westerholm Family, 1930 U.S. Federal Census, Seattle, King Co., Washington, block 5133, ED #17-173, SD #2, Sheet #30A, enumerated 14, April, 1930 by Rebecca E. M. Crauley. Much to my delight John is still living with them in 1940. Line 22, 14 Ave So., 1710, 264, 0, 9000, Westerholm, Capt. Axel, Head, M, W, 62, M, No. 6, born Sweden, NA, Same house, No, yes, Captain Ship, Alaska Steam Co., pw, 130 etc. Westerholm, Helen, wife, F, W, 65, M, No, 6, born Minnesota, Same house, no, no, no, no, no, H, no occupation. Barclay John A., brother-in-law, M, W, 67, S, No, 6, born Minnesota, Same house, no, no, no, no, no, U, no occupation. Source: Capt. Westerholm Family, 1940 U.S. Federal Census, Seattle, King Co., Washington, block 61-62-63, SD#1, ED#40-278, Sht #13, enumerated on April 13, 1940 by Elizabeth Glemley. Neither Helen (Sarah Ellen) nor John seemed to escape tragedy in their lives. Helen’s husband Axel was a Captain and his ship blew up. An article about this accident at sea appeared in the Seattle Times Monday 24 April 1944 on page 7, column 2, 3 and more. The article also had pictures of the Capt and Mrs. Westerholm but I cannot share them here. What follows is only a portion of the article. Families of the seafaring men lost in the sinking of the Liberty ship John Straub last Wednesday today clung desperately to the hope that their men had reached shore safely or boarded ships nearby in Alaskan waters. Notified yesterday of the disaster, the wives and mothers telephoned each other and sought information additional to the meager accounts of survivors and Coast Guard officials. The articles goes on to describe other men involved in the accident. There are other articles on the same page discussing the Liberty Ships and why they were in the waters in that location. Helen Westerholm buried her brother John Avery Barclay at Mount Pleasant near her first husband Lewis Sears on Queen Anne Hill in Seattle, Washington in 1951. She herself passed on 16 August 1957. Image #1135, Doc#15366, Helen S. Westerholm, 16 Aug 1957, 86 Female, father John Bartlay, mother Minerva Parks, in Seattle, King Co., Washington. Funeral: Westerholm – Helen S. 641 East 72nd, Mother of Raymond Steadman, Seattle. Private services Monday 11 a.m. Green Lake Funeral Home, Interment Evergreen. page 48, column 4. Obituary: Mrs. Alex W. Westerholm. Private funeral services for Mrs. Helen Sears Westerholm, 86, will be held tomorrow in the Green Lake Funeral Home. Burial will be in Evergreen. Mrs. Westerholm died Friday in a nursing home after a long illness. Mrs. Westerholm was born in Minnesota. She came to Seattle from California in 1912. She was a member of the Methodist Church. Mrs. Westerholm was the widow of Capt. Alex W. Westerholm master of the Liberty ship John Straub. He was killed when the ship exploded in Alaskan waters April 19, 1944. Mrs. Westerholm is survived by a son, Raymond A. Steadman, Seattle. Here we finally see that Raymond Steadman was Helen’s son. He has appeared in the census with Minerva mother of Helen as a boarder and grandson. Who the father is unclear at this time and does this mean that Helen (Sarah Ellen) was married a 3rd time? 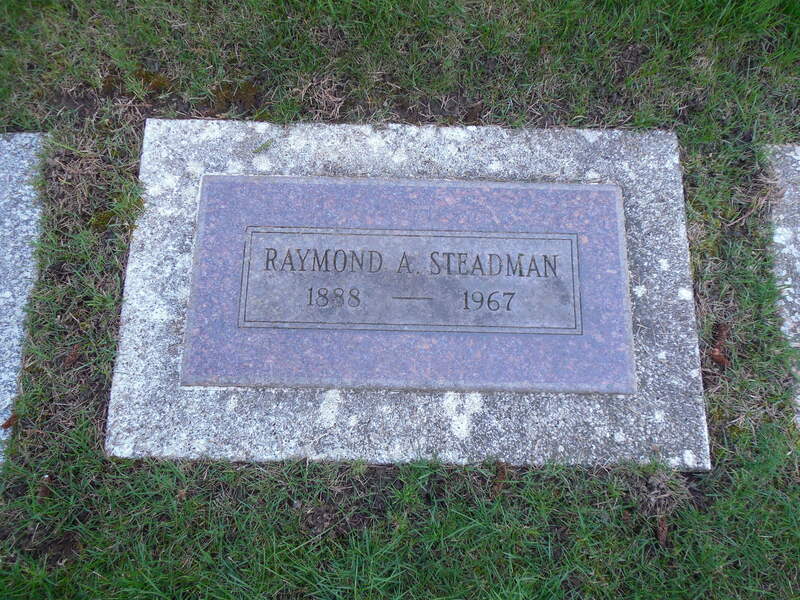 Raymond Steadman was born about 1889 in California and died on 24 January 1967 in Seattle, King Co., Washington in the Seattle Times Newspaper. Unfortunately it does not tell us about his parentage. Obituary: Raymond A. Steadman – Funeral services for Raymond A. Steadman 78, of 7018 Fifth Av. N.E. will be at 10:30 o’clock tomorrow in the Acacia Chapel, with burial in Acacia. He died yesterday in a hospital after a brief illness. Mr. Steadman came here from his native San Francisco 20 years ago. He owned and operated the Lake City Motel nine years, and also was an apartment house owner. 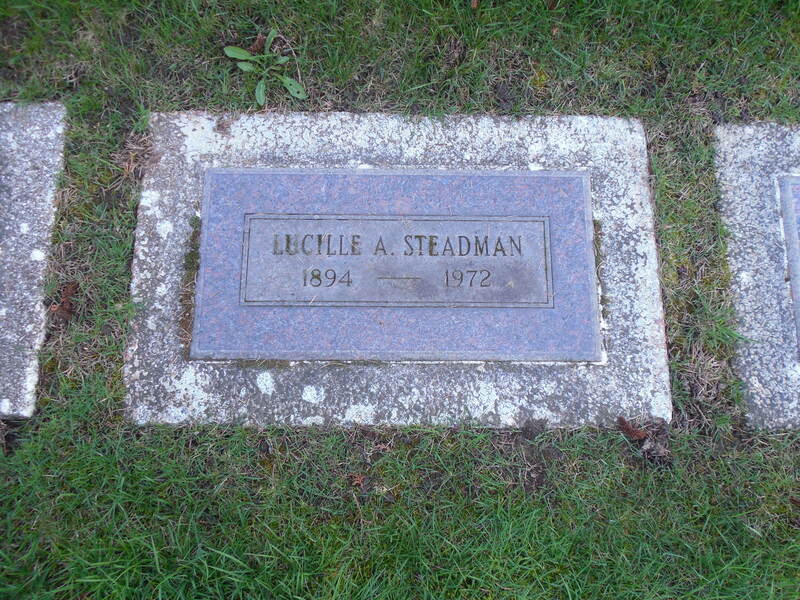 His wife Lucille A. Steadman survives. Update 2/21/2015: Acacia Cemetery is very near so I visited it and found the gravesite for Raymond and Lucille. Lucille Steadman’s stone is to the right of Raymond’s. Raymond Steadmans Tombstone, Acacia, Seattle, WA. In the next post I will write about Minerva Parks Barclay Buchwald and what happened to her, the mother of John Avery and Helen (Sarah Ellen) Barclay. John Avery Barclay, a son of John Barclay and Minerva Parks and nephew to George and Alexander Barclay, submitted an affidavit to the Probate Court of Dakota County, Minnesota. His sister and aunt also did the same. As a result John Avery Barclay became an heir to Alexander Barclay’s estate because his father John Barclay had disappeared years ago and was presumed dead. What follows is a mix of my research and my cousins, a descendant of this man. I thank her for sharing. 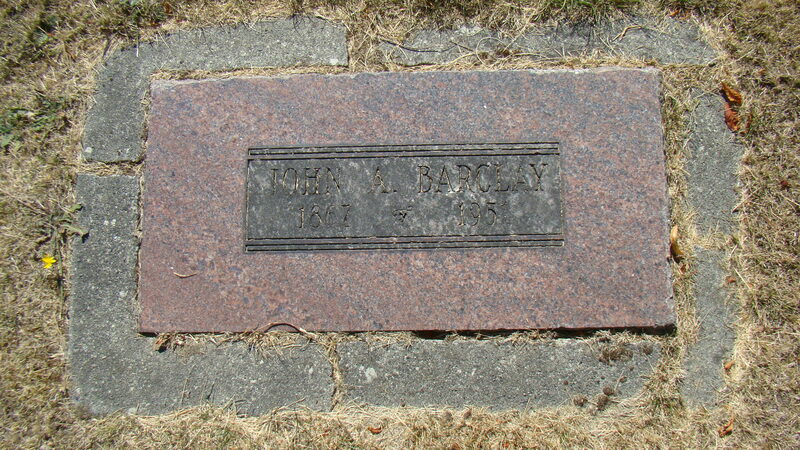 John Avery Barclay was born 23 July 1867 in Sibley Co., Minnesota per my information. His death certificate has 3 June, 1866 as his birth date signed by the hospital where he passed. He died on 8 March 1951 in Seattle, King Co., Washington. In the 1870 U.S. Federal Census John is with his father and mother in Sibley Co., Minnesota. Please note the spelling of the name as Barkley. Line 12, 11, Barkley, John, 35, M, W, Farmer, $1500, $500, Scotland, parents of foreign birth, male citizen. Barkley, Norva, 21, F, W, keeping house, born PA. Barkley, Abraham, 4, M. W, born Minnesota father of foreign birth, Barkley, Ellen, 2, F, W, born Minnesota, father of foreign birth, Allis, 2/12, M, W., father of foreign birth, Apr. Source: John Barkley Family, 1870 U.S. Federal Census, Sibley Co., Minnesota, page 2, 17 June 1870. Note: Why they used the name Abraham I do not know? This census gives his age as 4 years old. This means he was born 1866? The 1880 U.S. Federal Census has John with his mother and sister in Sonoma Co., California and there is no mention of John Barclay the father. Note: Here they state the children, John and Ella,were born in Wisconsin. This has his birth year as 1867. Minerva (Lulu) is not born in New York, not Pennsylvania. On 27 July 1889 John Avery Barclay married Harriette Louise Arcan in Santa Cruz, Santa Cruz Co., California. The Marriage of John Bartley native of Minnesota, aged 22 years, resident of Santa Cruz, County of Santa Cruz, State of California and Hattie Arcan native of California, age 20 years, resident of Santa Cruz, County of Santa Cruz, State of California. In witness whereof I have hereunto set my hand and affixed the Seal of the Superior Court of said County, this 27th day of July, 1889. Ed Martin County Clerk of Superior Court of Santa Cruz by C. H. Ward Deputy Clerk. I hereby certify that I believe the facts stated in the above License to be true and that upon due inquiry there appears to be no legal impediment of the Marriage of said John Bartley and Hattie Arcan, that said parties were joined in Marriage by me, on the twenty seventh day of July A.D. 1889 in Santa Cruz, said County and State and that Chas. F. Buchwald a resident of Santa Cruz, and county of Santa Cruz State of Calif. and Minivrina Buchwald a resident of Santa Cruz, County of Santa Cruz, State of California were present as witnesses of said Ceremony. In witness whereof, I have hereunto set my hand this twenty seventh day of July A.D. 1889 – H. Brueck Pastor of the German M.E. Church of Santa Cruz. Filed for Record at request of H. Brueck this 29 day of July A.D. 1889 at 40 minutes past 9 o’clock am and recorded August 24, 1889. Ed. Martin. Note: Minerva Barclay, the mother, remarried to a Charles Buchwald on 19 June 1886 in Los Angeles, California. Harriette was the daughter of Charles Edward Arcan who was born before 1849. She was born 22 December 1871 in Santa Cruz. She died there on 21 December 1951. Harriette Barclay, Member of Pioneer Local Family, Dies, Dec. 21, 1951. Harriette Louise Barclay, a native of Santa Cruz and a member of the one of the early pioneer families died in San Francisco yesterday. Services are to be conducted tomorrow at 11:30 am from the mortuary of W.C. Lasswell and company, San Francisco, and interment is to take place at Mount Olivet Memorial Park. Mrs. Barclay’s grandfather was John B. Arcan, who was born in Versailles, France and lived in Montreal, Canada, before coming to the United States. He lived for a time in New York, then in 1849 came across country with a party organized in Chicago, taking the southern route, across Death Valley. They made their home in Santa Cruz, owning the corner where the Bank of American now stands. There they put up a building with a second floor room which was used for dances. Charles Edward Arcan, Mrs. Barclays father, was a baby when the party crossed Death Valley. Later he became prominent in Santa Cruz and was well known as an athlete and baseball player. Surviving Mrs. Barclay are her children, Charles, Ella Barclay and Mrs. Violet H. Stark, her grandchildren, Harry and Edward Stark and Edward Barclay and five great grandchildren. Source: Santa Cruz Newspaper (name not given), Harriette Barclay, Member of Pioneer Local Family, Dies, Dec. 21, 1951. 1. Violet Harriette Barclay, born 10 January 1890 in Santa Cruz and died on 14 September 1982 in California. She married Edward Stark about 1909 and had two children. I have her in the 1900 and 1920 U.S. Census. 2. Ella May Barclay born 7 January 1892 in San Francisco, California and died 1 March 1956 in California. She married a Becker after 1910 in California. She is featured in the 1900, 1910, 1920 and 1930 U.S. Federal Census. 3. 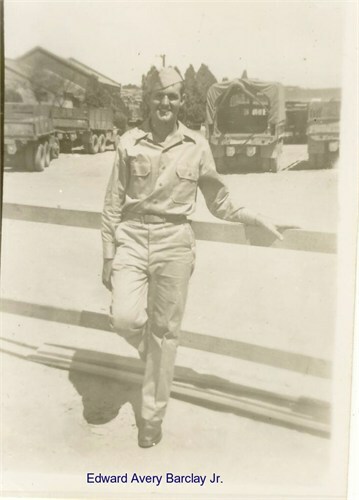 Charles John Barclay was born 7 May 1894 in San Francisco and died on 31 May 1975 in Hollister, San Benito, California. He is found in the 1900, 1910, 1920 and 1930 census. 4. Edward Avery Barclay born 11 November 1896 in San Francisco, and died 24 July 1937 in California. He married an Elsa MacPherson born 31 May 1905 in Butte, Montana and died 11 May 1978 in San Mateo, California. They had one son Edward Avery Barclay. Edward married Alma E. Hardy and they had four children. It is this family that my cousin is from and there are living descendants of this family who live on the West Coast. Church St, line 65, 1729? 111, 136, Barclay, John A., head, W, M, July 1868, 31, M, 11 yrs., born Minn, father born Scotland, mother Minnesota, Restaurant waiter, 0, yes, yes, yes, R, H. Barclay, Harriet, Wife, W, F, Dec, 1871, 29, M, 11, 4 born, 4 living, born Calif, father Illinois, mother Louisiana, yes, yes, yes. Barclay, Violet, daughter, W, F, June 1881, 10, S, born Calif, father Minnesota, mother California, at school, 9, yes, yes, yes. Barclay, Ella, daughter, W, F, June 1892, 8, S, born Calif, father Minnesota, mother Calif., at school, 9. Barclay, Charles, son, W, M, May 1894, 6, S, born Calif, father Minnesota, mother Calif. Barclay, Edward, son, W, M, Nov. 1896, 4, S, born Calif, father Minnesota, mother Calif. Source: John Barclay Family, 1900 U.S. Federal Census, San Francisco, San Francisco County, California, ED 1, SD 139, Sheet 6? 6, June, 1900 William C. Irwin? Meanwhile the Charles and Minerva Buchwald family are living in San Francisco, California in 1900. Line 83, 227, 191, 196, Buchwald, Charles, Head, W, M, March 1857, 43, M, 14, born Ohio, parents Germany. Steadman Raymond, grandson, W, M, May 1884, 16, S, born California. Source: Charles Buchwald Family, San Francisco, San Francisco Co., California, SD#1, ED#141, Sheet #, 36th assembly district, enumerated 8 June 1900, by Henry D. [Faumey]. 1910 U.S. Federal Census has John Barclay in San Francisco and this time he is divorced and living with his mother’s family. Flood St.- Line 95, 324, 158, 170, Buchwald, Chaley F. Head, M, W, 56, M1, 24, born Ohio, father born Germany, mother born Germany, English, Cook, Restaurant, W, No, O, yes, yes, yes, O, Ti, H. Buckwald, Lulu, wife, F, W, 62, M2, 24, 5, 2, born PA, parents born PA, English, None, yes, yes, no. Source: Chaley Buckwald Family, 1910 U.S. Federal Census, San Francisco, San Francisco Co., California, 33 District, SD#4, ED# 71, Sht#7, enumerated on 30 April 1910 by C.A. Parker. Note: Based on this information it is looking like Charles and Minerva had Maggie, Godfrey and Mabel. Of course this will need to be verified. After their divorce Harriette Barclay is listed separately with her children in the 1910 U.S. Census. Line 6, 3174, 137, 214, Barclay, Harriett, L. Head, F, W, 39, D, 4 born, 4 living, California, Illinois, Louisiana, all speak English, own income, yes, yes. Barclay, Ella, daughter, F, W, 18, S, California, Minnesota, California, cashier, Theater, W, yes, 12, yes, yes, no. Barclay, Charles, son, M, W, 15 S, California, Minnesota, California, errand boy,warehouse, W, no, 50, yes, yes, no. Barclay, Edward, Son, M, W, 13, S, California, Minnesota, California, none, yes, yes, yes. Source: Harriette Barclay, 1910 U.S. Federal Census, for San Francisco, San Francisco Co., California, Dist 32 part of 13 Precinct, part of San Francisco City, 19 April 1910, Edward J. Preve, SD# ?, ED 75th? It looks like Violet stayed with her grandmother Minerva. Line 12 Flood Ave., 324, 4, 4, Buchwald, Charles, Head, O, M, M, W, 62, M, yes, yes, born Ohio, born Germany, parents born Germany, speaks German, yes, cook, restaurant, W 954. Buchwald, Mervia, wife, F, W, 68, M, yes, yes, New York, parents born New York, none. Buchwald, Violet, 18, S, yes, yes, California, father born Ohio, mother New York, sales lady, store, W, 791. Barclay, John, boarder, M, W., 51, D, yes, yes, Minnesota, father born Scotland, mother New York, carpenter, house, w, 148. Harriette is present in the 1920 U.S. Census with some of her children. Rolhle St., 124, 187, 188, Barclay, Harriette, Head, O, F, F, W, 50, D, yes, yes, Calif., Illinois, Louisiana, yes, none. Barclay, Charles, son, M, W, 25, S, yes, yes, Calif., Minn., Calif, machinist, Fd Motor, Co., O A 362; Barclay, Edward A, Son, M,W, 23, S, yes, yes, Calif., Minn, Calif, machinist, Fd, Motor, Co. OA. Becker, Ella, daughter, F, W, 29, Dr. yes, yes, Calif., Minn, Calif, none. Source: Harriette Barclay Family, 1920 U.S. Federal Census, San Francisco, San Francisco Co., California, 123 Assembly Dist. SD #4, ED #140, Sht# 8A, 40 Prec. 10 and 12th of January, 1920, Davis, Mrs. Mary. Harriet L. Barclay appears in the 1930 census. Charles is still with her and so is Ella as Ella Becker. John Avery Barclay the father has gone to Seattle and is living with his sister, see the next post about Sarah Ellen/Helen Barclay Sears Westerholm. Line 11, 124, 73, 76, Barclay, Harriet L, Head, O, $5000, R, No, F. W, 60, Mt/Wd, no, yes, born Calif, father Chicago, Illinois, mother Louisiana, yes, none. Barclay, Charles, J. Son, M, 35 S, no, yes, born Calif, Minnesota, Calif., yes, mechanic, automobile, 7623, W, No, 9, No. Becker, Ella M. Daughter, F, 38, D, no, yes, California, Minnesota, Calif., none. Source: Harriet L. Barclay, 1930 U.S. Federal Census, San Francisco, San Francisco Co., California, ED 38-70, SD 7, Sht 5A, AD 25, Block 726, April 5, 1930, Mrs. Sophis Louder. Alive on 3/8/1951 death at 9:45 pm. Funeral directors: Butterworth & Sons. Obituary Mar 10, 1951 pg. 10, John W. Barclay – John W. Barclay, 84, of 1215 E. 64th St. died Thursday. Mr. Barclay a carpenter, had lived in Seattle 20 years. He was born in Minnesota. Surviving is a sister, Mrs. Helen Westerholme, Seattle. Funeral services will be held at 1 p.m. Tuesday at the Butterworth Chapel. Funeral Notice Mar 11, 1951 – Barclay John Avery of 1215 East 64th St. 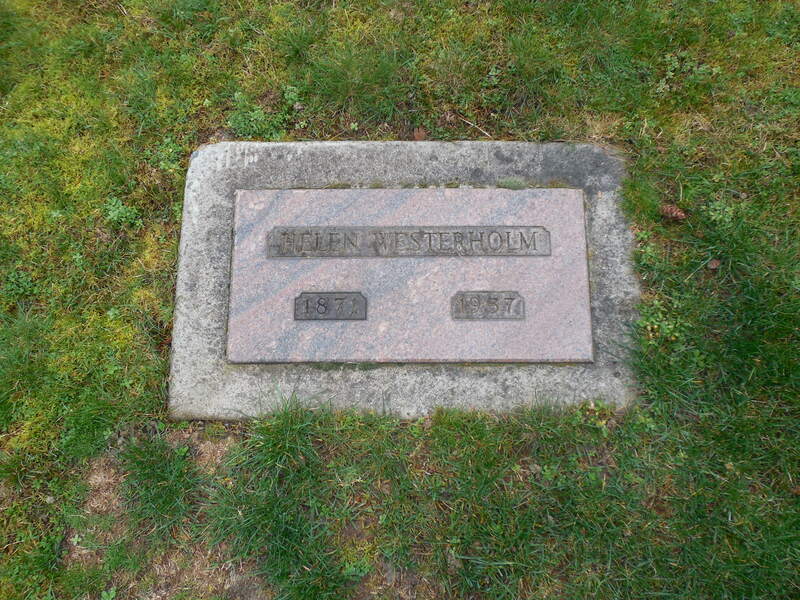 Brother of Mrs. Helen Westerholme, Seattle. Services Butterworth’s Drawing Room Chapel 1 p.m. Tuesday. Burial Mt. Pleasant Cemetery. Source: Obituary Sat. Mar. 10, 1951 for John W. Barclay and Funeral Notice Mar 11, 1951 for John Avery Barclay, Seattle Post Intelligencer. John is buried in Mount Pleasant Cemetery on Queen Anne hill in Seattle, Washington. He is next to the tombstone of Lewis Sears, a husband of his sister. These tombstones are in the section just left of the office building. Of course, there is always more research that can be done on a family and I could look for more census, divorces, funeral home records and other documents. At this time, I will move on and share about John’s sister Helen (Sarah Ellen) Barclay Sears Westerholme.